If you are unsure about eyeglasses, but need them to correct your vision; contact lenses can be the alternative you have been looking for. Contacts are lightweight, durable, bendable and nearly invisible; so you won't even know you are wearing them! 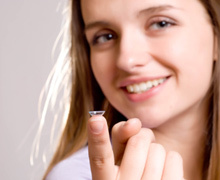 The choice between eyeglasses or contact lenses is totally yours; however, we can be here to assist in your decision. Together we will look at your unique need and lifestyle and will decide if you would best be suited for glasses or contacts. All of the contact lens brands we offer are top-of-the-line; however, are meant for different needs and lifestyles. We will discuss which brand would best suit you. At Springfield Opticians, we pride ourselves on giving all of our customers the one-on-one attention they deserve. Every client has a unique eye care need, and a unique lifestyle. We are here to accommodate that as best we can.